Set of 2 Reusable K-Cup Coffee Cups with 50 Filters - 100% Compatible with Keurig. Take control of your own Coffee with Simple Cups Resuable Coffee Cups and filters. Don't spend more than $50 per lb for K-cup Coffee. 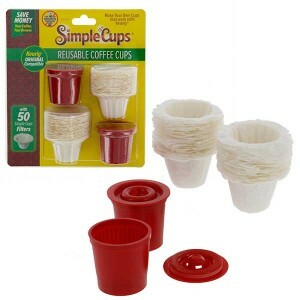 Using Simple Cups Reusables saves as mus as 80% of your cost. Easy to Use, easy to clean. Enjoy your coffee the way it was supposed to be enjoyed.